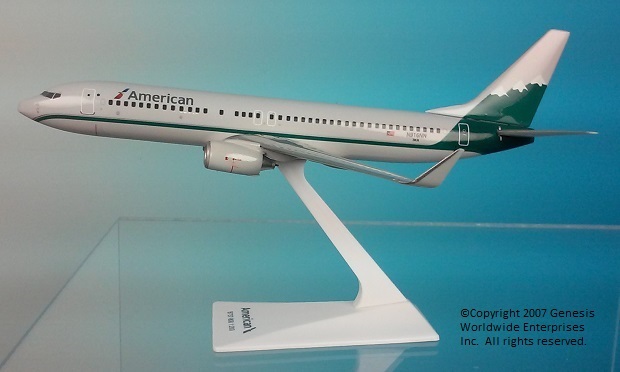 Flight Miniatures 1:200 Scale Plastic Snap-Fit – Boeing 737-800 – Length:7.5" Wingspan: 6.75/7.75 (winglets)"
Reno Air was founded in June 1990. The airline's first flight was on July 1, 1992 with nonstop jet service from Reno (RNO) to Seattle-Tacoma International Airport (SEA) in Seattle, Washington. By April 1993, Reno Air was serving the following destinations from its Reno hub with nonstop jet flights to Los Angeles (LAX), Kansas City (MCI), Minneapolis/St. Paul (MSP), Ontario, CA (ONT), Portland, OR (PDX), San Diego (SAN), San Francisco (SFO) and Seattle (SEA). The Reno Air fleet consisted of McDonnell Douglas MD-80 (series -81, -82 and -83 models), MD-87 and MD-90 aircraft. In February 1999, Reno Air was purchased by American Airlines, and flew its last flight on August 30 of that year. At the time, the purchase was seen as a way to feed American's east-west route network with Reno Air's north-south flights, primarily through San Jose.